Atherosclerosis of cerebral arteries. A. Severe atheromatosis of basal arteries. Confluent yellow atheromatous plaques occur in the arterial walls. The basilar artery is elongated and stiff, and the lumen is distended. The sclerotic right carotid presses on the optic nerve. B. The atheromatous basilar artery displays focal dilation and narrowing of the lumen and presses on the pontine basis. The rigid walls of the carotids press on the optic nerves. C. Atheromatous plaque in the wall of the basilar artery shows focal subintimal cholesterol clefts, disruption of the elastic lamina, and marked intimal proliferation severely reducing the lumen (van Gieson). fourth of the cardiac output is to the brain—an average blood flow of 700 to 800 mL/min (55 to 65 mL/100 g/ min). A reduction of blood supply to 15 to 20 mL/100 g/ min for a few minutes produces ischemia and neurologic deficits. A prolonged fall to 8 to 10 mL/100 g/min results in ischemic necrosis, that is, an infarction. Arteriosclerosis of the cervicocranial arteries and diseases of the heart are primary causes of infarctions in the elderly. A group of less common but important etiologies affect chiefly younger individuals and are presented in the section, Various Stroke Etiologies. Arteriosclerosis of cervicocranial arteries. Atherosclerosis affects chiefly the large arteries: the extracranial cerebral arteries and their major intracranial branches. Preferential sites are the bifurcations of common carotid arteries, origins of internal carotids, and vertebral arter ies. Intracranially, atheromatosis commonly develops in the cavernous segment and syphon of carotids, and at the points of junction, proximal segments, and bifurcations of major arteries. The atherosclerotic artery is rigid, elongated, or tortuous. The lumen is distended or reduced, and the wall contains multiple, often confluent yellow atheromatous plaques (Fig. 4.1). Potential consequences of atherosclerosis. Atherosclerosis promotes infarction in several ways (Fig. 4.2): (a) It predisposes to local thrombus formation and luminal occlusion; (b) it is a potential source of fibrinoplatelet and cholesterol emboli to the brain; and (c) it can critically reduce the vascular lumen by 70% or more, thus rendering the arterial territory vulnerable to systemic circulatory insufficiency. Consequences of atherosclerosis. A. Thrombotic occlusion of MCA in the Sylvian fissure causing a large infarct. B. Cholesterol embolus in a small leptomeningeal artery overlying a cortical infarct, hematoxylin-eosin (HE) C. Hemodynamically significant (greater than 75%) stenosis in a carotid endarterectomy specimen. Pathologic forms of arteriolosclerosis. A. Fibrohyalinosis with mural thickening and luminal stenosis (HE), B. Mural lipid deposits (oil-red-O). C. Eccentric microatheroma (LFB-HE). D. Markedly thickened, structureless fibrotic wall and virtually nonexisting lumen (HE). atheroma, and fibrinoid necrosis (Fig. 4.3). These changes are commonly associated with chronic hypertension and are important in the etiology of lacunar infarcts. Arterial supply of the brain. Schematic drawings of territorial supplies of major cerebral arteries on (A) lateral, median, and basal surfaces; (B) and (C) on transverse planes; and (D) on horizontal plane. Blue, anterior cerebral artery (ACA); red, middle cerebral artery (MCA); yellow, posterior cerebral artery (PCA); green, anterior choroidal artery (AchA). infarct with overlying thrombus. Arrhythmias are apt to dislodge platelet or fibrin fragments and calcium flecks from a mural thrombus or from the valves. 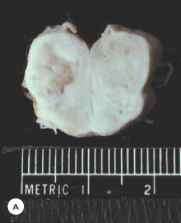 A left atrial myxoma is a rare source of emboli. An atrial septal defect (right-left shunt) opens the way to emboli from deep venous thrombi to the brain (paradoxical emboli). Heart failure with systemic hypotension or hypovolemia is another important cause of focal ischemia in the territory of a severely stenotic artery. Less common etiologies. This group comprises various vasculopathies and vasculitis, hematologic diseases, iatrogenic complications, illicit substance abuse-related diseases, and some inherited metabolic diseases (see section, Various Stroke Etiologies). • Type of infarct. A bland infarct is pale over the entire area, and a hemorrhagic infarct contains confluent petechial hemorrhages in the cortex and subcortical gray structures (Fig. 4.5). Emboli are an important cause of a hemorrhagic infarct. The bleeding occurs through damaged capillary walls, following fragmentation and migration of the embolus. Bleeding distally to the occlusion through retrograde collateral circulation is an alternative mechanism. 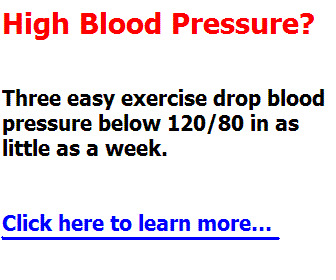 A sudden rise in blood pressure can precipitate such a situation. • Age of infarct. An infarct evolves through three stages: necrosis, liquefaction, and cavitation (Fig. 4.6). During the acute stage, which occurs approximately the first week following stroke, the ischemic tissue undergoes necrosis. During the first 24 hours, it swells, appears somewhat pale, and is slightly soft. After 24 to 48 hours, it becomes friable, breaks up, and is demarcated from the surrounding healthy tissue by artificial cracks. • During the acute stage, ischemic necrosis invariably is associated with edema (cellular and vasogenic), which reaches its peak by the fifth or sixth day. 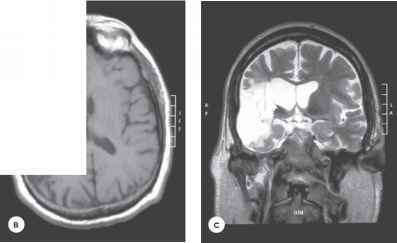 Cellular edema affects chiefly the gray matter, and vasogenic edema affects the white matter. Importantly, extensive edema, by increasing the brain volume, leads to herniations with brainstem and medullary compression. These subject the patient to serious risk of deterioration and even death. Age: Acute—ischemic necrosis Subacute—liquefaction Chronic—cavitation fies, which may take 2 to 3 weeks. Gradually, the edema resolves, the tissue debris is removed, the infarcted area shrinks, and ultimately is transformed into a cystic cavity. This chronic stage of cavitation may take several weeks or months, depending on the size of the infarct. • Size and arterial territories. Infarcts are situated within territorial boundaries of the arteries subjected to ischemic insults. A large infarct occupies all or part of the supply territory of a cervical or large intracra-nial artery; a large infarct is commonly caused by atherothrombotic or thromboembolic occlusion. It is more common in the carotid than in the vertebral arterial territory (Figs. 4.7 through 4.10). The most common site is the territory of the middle cerebral artery (MCA). Types of infarcts. A. Pale, bland infarct in carotid territory (MCA and ACA). B. Hemorrhagic infarct in MCA territory. Petechial hemorrhages are confined to the gray structures. Morphologic evolution of infarcts in MCA territory. A. Ischemic necrosis. Note the swelling of ischemic territory and compression of adjacent ventricle. B. Liquefaction of ischemic tissue. C. Cavitation following removal of tissue debris. Note the enlargement of adjacent ventricle, indicating chronicity of the lesion. Infarcts in carotid arterial territories. MCA infarcts: A. cortical (parietal artery). B. basal ganglia (lenticulostriate artery). C. ACA infarct. D. AchA infarct. E. MCA and ACA infarct. Infarcts in vertebrobasilar arterial territories. A. PCA infarct. B and C. Bilateral midbrain infarcts (LFB-CV) (peduncular branches of PCA and BA). Basilar artery infarcts. A. Extensive thrombotic infarct involves the basis and tegmentum of the pons. B. Pontine basis infarct (myelin stain). C. Cerebellar infarct (SCA territory). Vertebral artery infarcts. A and B. Gross and histologic picture of lateral medullary infarct (LFB-CV), the territory of the posterior inferior cerebellar artery, (PICA). Watershed infarcts. A. Cortical infarct in the border zone between ACA and MCA showing B. laminar cortical pan-necrosis (the external cortical layer is spared (HE). 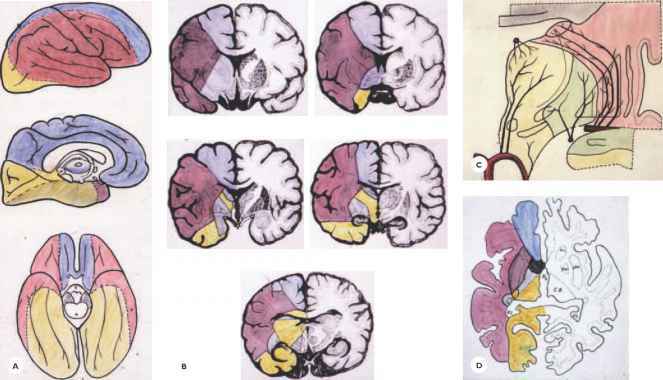 C. Bilateral cortical-subcortical infarcts in the border zones between ACAs and MCAs. D. Corti-cal-subcortical infarct in the border zone between MCA and PCA. lateral ventricle, and the subinsular region (Fig. 4.13). Systemic hypoperfusion due to cardiac failure, hypotension, or hypovolemia, plays a primary role in the pathogenesis. Alternate mechanisms are atheromatous occlusion, microembolus, and, less often, stenosis of extracranial or large intracranial arteries. 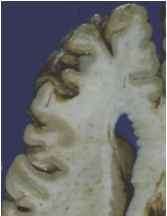 Multiple infarcts may occur within the carotid or vertebrobasilar territories, or within both. Concomitant infarct and hemorrhage. 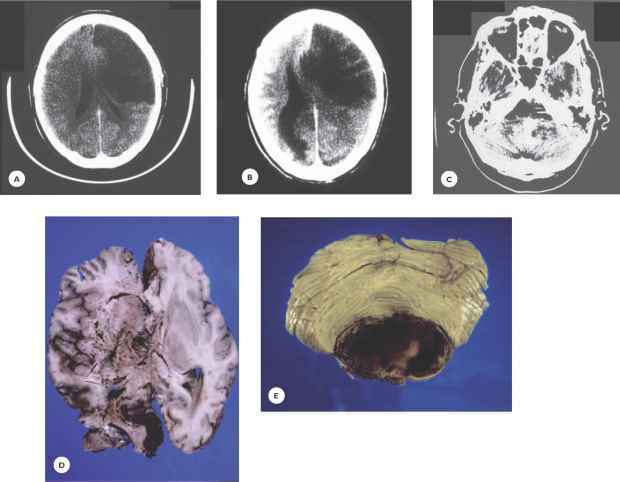 It is not unusual to find within one brain recent or old infarcts and hemorrhages together (Fig. 4.14). Ischemia elicits a chain of interrelated events: necrosis, edema, inflammatory reaction, macrophage activation, and marginal astrocytic proliferation (Table 4.2). Ischemic necrosis. During the first 24 to 48 hours, the ischemic tissue appears vacuolated, spongy, and stains faintly with eosin (Fig. 4.15). The distribution is patchy; faintly stained hypoperfused areas alternate with hyper-emic areas (luxury perfusion) due to loss of autoregulation and early venous filling. The hypoperfused but potentially viable tissue around the ischemic core, the so-called penumbra, provides the rationale for instituting therapy to rescue it from being incorporated into the infarction. Lacunar infarcts. 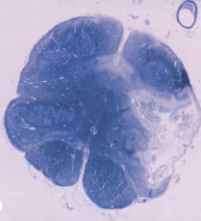 A. Basal ganglia (lenticulostriate artery). B. Thalamus (thalamoperforating artery). C. Pons (paramedian branches of BA). Giant white-matter lacunar infarct in the border zone between cortical and deep penetrating arteries. Concomitant hemorrhagic and ischemic strokes in a 75-year-old hypertensive woman. She developed ballistic movements in her right extremities, followed 4 days later by left hemipa-resis. Gross section shows a fresh hemorrhage in the left subthalamic nucleus and a recent right MCA infarct. karyon, or as ghost neurons with pale perikaryon and nucleus. As the neurons undergo necrosis, changes also occur in the myelin, nerve fibers, and glial cells. The myelin first loses its affinity for Luxol fast blue. Then, by about the third day, the myelin gradually disintegrates into neutral lipid globules. Along with the myelin, the nerve fibers break into small fragments, and residual axonal retraction balls may remain at the margin of the infarct. Within the severely affected ischemic areas, the oligodendrocytes and astrocytes also disintegrate. The capillaries, least vulnerable to ischemia, show endothelial hypertrophy and hyperplasia (see Fig. 4.15). 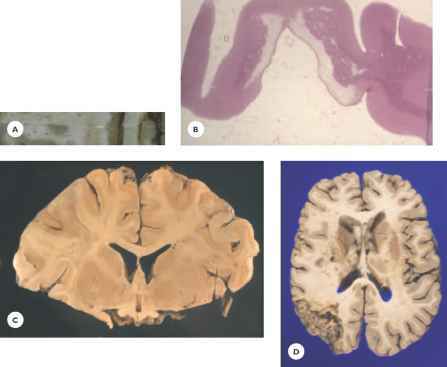 Histologic evolution of infarcts. Ischemic necrosis. 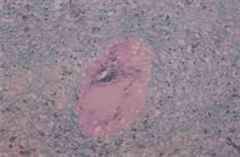 A. Ischemic tissue stains faintly with eosin, is vacuolated and spongy. B. Ischemic (red) neurons display a strongly eosinophilic, shrunken perikaryon and a homogenous dark basophilic nucleus (HE). C. Myelin disintegrates into small lipid globules (LFB-CV) and (D) the axons into small fragments (Holmes stain). E. Capillaries are prominent (reticulin stain). Edema. Two types of edema develop in ischemic tissue: cellular and vasogenic. In cellular (cytotoxic) edema, swelling of the neurons and astrocytes develops within a few hours after the ischemic insult. This swelling results from the opening of the ion pump and the excessive inflow of sodium, chloride, and water into the intracellular compartment and outflow of potassium into the extracellular compartment. Vasogenic edema develops 2 to 3 days after the ischemic insult and reaches its peak by the fifth or sixth day. It results from breakdown of the blood-brain barrier and the escape of fluid and protein into the extracellular space, chiefly into the white matter. The white matter swells and stains faintly with Luxol fast blue. The myelin sheaths are separated from each other, and the pericapillary spaces are filled with plasma fluid (Fig. 4.16). Inflammatory reaction. 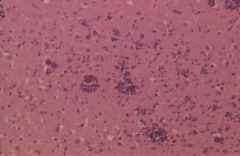 During the first 24 to 38 hours, the ischemic tissue is invaded by polymorphonuclear leucocytes (Fig. 4.17). This inflammatory reaction, mediated by cytokines, aggravates the ischemic injury by producing toxic substances and obstructing the microcirculation. Macrophage activation. By about the third day, the leucocytes are replaced by macrophages derived from blood monocytes and activated microglial cells. The macrophages phagocytose the tissue debris and remove it to the blood vessels and subarachnoid space (Fig. 4.18). So, gradually, the infarcted tissue is transformed into a cystic cavity, the lumen of which is traversed by a fine fibrous meshwork derived from surviving capillaries (Fig. 4.19). Marginal astrocytic proliferation. At the margin of the ischemic tissue, the astrocytes proliferate into large gemistocytic astrocytes, forming a transition zone between the infarct and the healthy tissue (see Fig. 4.19). Histologic evolution of infarcts. Vasogenic edema. A. Plasma fluid fills the perivascular space (LFB-CrV-E). Histologic evolution of infarcts. Inflammatory reaction. Poly-morphonuclear leukocytes invade the ischemic tissue during the first 24 hours (HE). Histologic evolution of infarcts. Macrophage activation. A. By the second and third day, macrophages invade the necrotic tissue. B. Cytoplasms of macrophages are filled with tissue debris, which is then removed to the perivascular spaces. C. Collection of macrophages around a blood vessel (LFB-CV-E). Histologic evolution of infarcts. Marginal astrocytic proliferation. A. Chronic cavitated infarct contains a few remaining capillaries and macrophages within the lumen. B. The margin consists of proliferated gemistocytic astro-cytes (HE). mediated excitotoxicity and lactic acidosis play key roles in ischemic necrosis. Excitotoxicity. Ischemia initiates the release and excessive accumulation of the excitatory neurotransmitters glutamate and aspartate and related amino acids in the extracellular space. By exciting the neuronal membrane receptors, these neurotransmitters depolarize the synap-tic membranes, allowing ionic and water exchange; the inflow of sodium, chloride, and water into the neurons; and the outflow of potassium into the extracellular space. Most important, they promote the entry of calcium into the neurons. Intracellular overload of calcium interferes with mitochondrial and metabolic functions and eventually destroys the neurons. Lactic acidosis. Ischemia leads to anaerobic glycolysis and the formation of lactic acid and free radicals. The harmful effects of lactacidosis and free radicals, along with some other toxic metabolites, culminate in the breakdown of all components of neural tissue. Presentation. Ischemic stroke accounts for about 80% of all strokes. The clinical presentation is determined by the severity of the ischemic attack and its cause, and also by the adequacy of the collateral circulation and the presence of any stroke risk factors (Table 4.3). Transient ischemic attack (TIA). A mild and short isch-emic attack produces transient impairment of neuronal function. Focal neurologic symptoms and signs develop suddenly, progress rapidly, and usually resolve within less than 24 hours. Clinical features of TIAs in the carotid and vertebrobasilar arterial territories are summarized in Table 4.4. Completed stroke. A severe ischemic attack lasting approximately from thirty minutes to 1 hour produces an infarction: The neurologic deficits remain prolonged or permanent. • Thrombotic stroke, accounting for about 50% of ischemic strokes, is often preceded by TIAs. The symptoms worsen steadily or stepwise during the first 24 to 48 hours (evolving stroke). • Embolic stroke, accounting for about 30% of ischemic strokes, has a very abrupt onset and rapid evolution of neurologic deficits that are maximal from the onset. The source of the embolus—heart, aorta, cer-vicocranial arteries—is usually evident, and the infarct is often hemorrhagic. • Hemodynamic stroke, accounting for 10% to 30% of ischemic strokes, results from systemic hypo-perfusion in the territory of a severely stenotic artery. Cardiovascular diseases that affect the systemic circulation are present, and the infarcts are preferentially located in watershed regions and terminal arterial fields. Clinical features of ischemic stroke greatly depend on the size and location of the infarcts. Large hemispheric and brainstem infarcts present with depression of alertness ranging from somnolence through lethargy to coma. During the acute stage, ischemic edema when severe, aggravates the clinical course and may endanger the patient's life. Seizures may occur during the acute stage or several weeks or months later. Mortality rate ranges from 10% to 20% during the first month. Cardiac and pulmonary complications account for about half the deaths. Neurologic deficits, particularly motor, remain in about 50% of survivors. 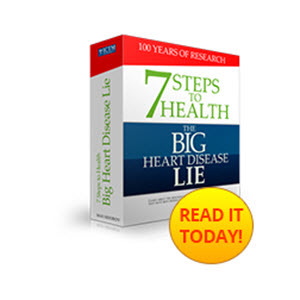 Behavioral changes, depression, and cognitive decline add to the clinical picture. 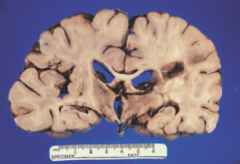 Multiple cortical or subcortical infarcts, depending on their locations, are the substrates of multiinfarct dementia. Ischemic strokes produce distinct syndromes for each arterial territory. Table 4.6 summarizes the common clinical manifestations of carotid territory infarcts. The occlusion of the internal carotid artery presents chiefly with features of a middle cerebral artery (MCA) territory infarct; contralateral motor and sensory deficits, visual field defect, and aphasia when the lesion is in the dominant hemisphere. If the occlusion extends beyond the point of origin of the ophthalmic artery, ipsilateral blindness occurs. Anterior cerebral artery (ACA) territory infarct is distinguished by motor and sensory deficits, predominantly in the leg. Neuropsychological dysfunctions are associated with infarcts in the territories of cortical branches of the MCA and the ACA. Infarcts in the territories of the vertebrobasilar arteries produce a great variety of syndromes (Table 4.7). Posterior cerebral artery syndromes generally present with various combinations of visual, sensory, and neuropsychological deficits. Large brainstem infarcts are the most detrimental, causing either a sudden loss of consciousness with extensive neurologic deficits or a "locked-in" syndrome with consciousness intact. It is important to differentiate between coma and conditions that superficially may be mistaken for coma (Table 4.8). Cross syndromes of unilateral brainstem infarcts manifest with ipsilateral cranial nerve deficits (3rd to 12th) and contralateral motor and sensory deficits. 'Contralateral, (D) dominant hemisphere, (nD) nondominant hemisphere. KEY: 1, MCA; 2, superior division; 3, inferior division; 4, lenticulostriate artery. 'Contralateral; D, dominant hemisphere. KEY: 1, ACA; 2, MCA; 3, AchA. An occluded or stenosed subclavian artery, proximal to the origin of the vertebral artery, steals the blood flow from the vertebral artery by reversing its direction. VA, vertebral artery; SA, subclavian artery. matter, and effacement of sulci. A large infarct, by the second or third day, is surrounded by edema, which produces a mass effect with ventricular compression and midline shift (Fig. 4.21). 2. From about 1 to 3 weeks, a subacute infarct often shows peripheral enhancement due to neovascularity (luxury perfusion). Sometimes, by the second week, the infarct is poorly visualized, a phenomenon referred to as fogging. 3. From 3 to 4 weeks on, a chronic infarct appears as a well-delineated, low-density lesion with a dilated ipsilateral ventricle due to tissue loss. (inability to read—ability to write) (D) Spatial disorientation (nD). 'Contralateral; D, dominant hemisphere; nD, nondominant hemisphere; ''Anton syndrome. KEY: 1, occipitotemporal atery; 2, calcarine artery; 3, thalamogeniculate artery; 4, thalamoperforate artery. "Branches of PCA and BA. ** Circumferential branches of superior and anterior inferior cerebellar arteries. 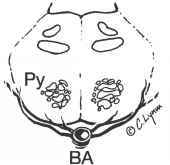 KEY: BA, basilar artery; Py, pyramids. KEY: 1, Spinotrigeminal tract; 2, sympathetic tract; 3, spinothalamic tract; 4, pyramids; 5, medial lemniscus; 6, acoustic/vestibular nucleus; 7, vagus motor nucleus; 8, hypoglossus nucleus. KEY: SCA, superior cerebellar artery, midbrain; AICA, anterior inferior cerebellar artery, pons; PICA, posterior inferior cerebellar artery, medulla; BA, basilar artery. CT scan images of infarcts. 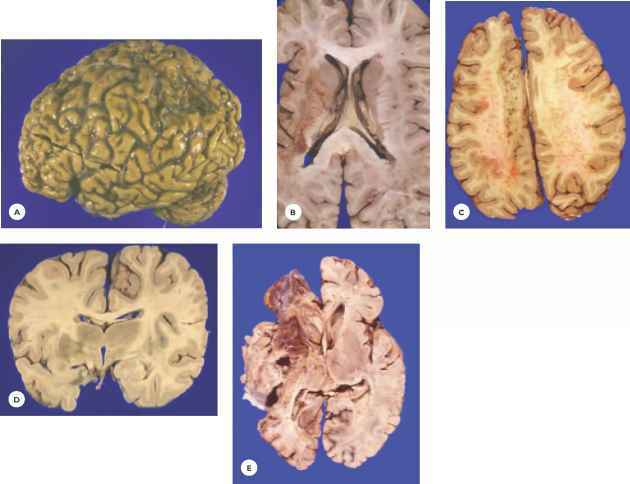 PCA infarcts in a 65-year-old man who developed cortical blindness following a severe hypotensive episode and died 4 days later. 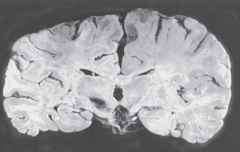 A. Axial CT scan taken 1 day after the episode shows slightly hypodense lesions in medial aspects of occipital lobes. B. Horizontal section of the brain shows acute infarcts in supply territories of PCAs. C. Intensely hypodense appearance of an old PCA infarct. Sequential CT scan of an internal carotid artery (ICA) infarct, with progressive mass effect from edema. A 58-year-old hypertensive man, following a few short TIAs, developed right hemiparesis, sensory deficit, and expressive aphasia. Nine days later, he died. Initial CT scan showed only obliteration of sulci in the left cerebral hemisphere (A). Three days later, a left hemispheric, large, hypodense lesion in the territory of the MCA and ACA compressed the ipsilateral ventricle (demarcation between infarct and edema is poorly defined). B. Eight days later, an increase occurred in the size of the lesion and of the mass effect, with obliteration of the ventricle and midline shift. C. A pons hemorrhage was also present (hyperdense lesion). D. Horizontal section shows a markedly swollen left hemisphere. The infarct obliterates the lateral and third ventricles. A fresh hemorrhagic infarct is present in the occipital lobe and (E) a massive hemorrhage in the pons, both consequences of edema and increased brain volume. MR images of cerebral infarcts. A. Acute ACA infarct appears as a hyperintense lesion on axial T2-weighted image. B. Old MCA infarct is hypointense on Tl-weighted image and hyperintense (C) on T2-weighted image. Note the enlargement of adjacent lateral ventricle indicating chronicity of the lesion. mass effect on T2-weighted images. A chronic infarct is hypointense on T1 and hyperintense on T2-weighted images (see Table 4.9; Fig. 4.22). Functional MRI with diffusion- and perfusion-weighted images is particularly valuable in identifying the ischemic territory within minutes postictally, thereby making early therapeutic intervention possible. Such images are also helpful in monitoring therapeutic efficacy. The pathology of the cervical and cerebral arteries is conveniently demonstrated with magnetic resonance angiogram (MRA) (Fig. 4.23). Color-flow Doppler is a useful screening test to demonstrate severe arterial stenosis and occlusion of the cervical and intracranial arteries. An invasive four-vessel angiogram is performed in selected cases at the discretion of the vascular surgeon (see Fig. 4.23). Which arteries supplies the sides of brain?